The whole chapter is based on this great book by David Mackay. Energy Resources - Andy Darvill's great website. Grouping Energy Sources Powerpoint - answers are in the notes pane. PhET Faraday's Law animation - see how a voltage is induced (using just a coil of wire and a magnet), with this interactive animation. 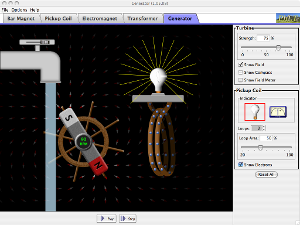 PhET Generator animation - see how a generator works, with this interactive animation.